Not only are Chinese firms drastically scaling back investments, but they’ve embarked on a record-setting wave of sales of real estate, hospitality and entertainment businesses. Including those sales, net Chinese foreign direct investment into North America turned negative in 2018 to the tune of $5.5 billion, according to Baker McKenzie. Another $12 billion of Chinese assets around the world are expected to be sold this year, the report said. The evaporation of Chinese money in the United States reflects self-imposed restrictions by Beijing on investments outside the country. The trend was exacerbated, though, because Washington has been tightening foreign investment reviews. The US-China trade war is also a contributor. After spending heavily on American real estate, transportation and infrastructure, Chinese investment in these sectors has “largely disappeared,” the Baker McKenzie report found. Chinese investment into the United States peaked at $45.6 billion in 2016, a year that saw insurance giant HNA splurge on a 25% stake in Hilton and Anbang Insurance acquire a string of high-end hotels. But foreign direct investment slowed to $29 billion in 2017, when China imposed restrictions on outbound investments in a bid to stem capital outflows. Investment in the United States then shrank to just $4.8 billion last year amid Washington’s crackdown on China — a “huge drop,” Kennedy said. In the meantime, US officials are scrutinizing Chinese investment with more intensity. The Committee on Foreign Investment in the United States has rejected several high-profile transactions, including Broadcom’s (AVGO) $117 billion bid for Qualcomm (QCOM). Last year, President Donald Trump signed legislation expanding the power of CFIUS to block foreign deals for national security purposes. At the same time, some of China’s most voracious buyers of American assets have come under pressure from Beijing. For example, early last year Beijing seized control of Anbang, the insurance giant that in 2014 completed a $1.95 billion purchase of the iconic Waldorf Astoria. The Chinese government later pumped nearly $10 billion into Anbang. Likewise, HNA, a conglomerate that grew out of an airline, has gone on an epic buying spree in recent years. 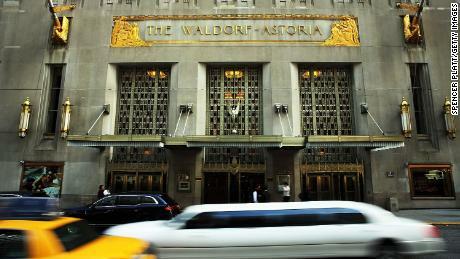 The Chinese company purchased chunks of everything from Deutsche Bank (DB) to Hilton. But HNA has since moved to unload businesses in response to Beijing’s crackdown on foreign purchases and concerns about the insurance company’s massive debt. “HNA had its wings massively clipped,” said Kennedy.